ChannelingSpiritual Life or Not…Time to Come Out! Spiritual Life or Not…Time to Come Out! In this call, Sri and Kira talk about coming out and living your spiritual life in authenticity with their special guest, James Tyberonn, founder of Earth-Keeper (earth-keeper.com). He’s one of the world’s most trusted experts in earth energies, healing crystals and gems, vortices and power nodes, sacred sites, and planetary-grid systems. He’s written four books, including “Earth-Keeper: The Energy and Geometry of Sacred Sites,” and he’s currently writing his sixth book on the metaphysical healing properties of gemstones. Sri and Kira began by discussing how the month of October calls upon the individual to come out and live a life of authentic spirituality. Instead of hiding our real selves behind a public face we chose to present to people, we are invited to open up to the rising waves of energy caused by a lunar eclipse and a solar eclipse this month and truly awaken to our spiritual truths. Only then can we become empowered to be who we are as we are meant to be. There are people in our lives that help us go through the pain of living. These are our partners in pain. They may be our best friend, a close family member, or just someone whom we trust enough to confide in. We needed them to listen to us, commiserate with our emotional and physical pains, and tell us that everything’s going to be okay. Instead of focusing on just one culture, let us open our mind and spirit to different cultures by traveling to different places around the world. This introduces us to different perspectives of how the world works, especially when it comes to using the earth’s energies to heal ourselves. There are sacred sites where these energies are strongest. People who visit these sites are in a better position to make use of healing crystals and gems to direct positive natural energies towards themselves. One of these incredible places is a lake in Eastern Siberia that’s surrounded by Buddhist monasteries and situated between the 50th and 55th latitudes. It has many minerals, including lapis lazuli, which is also found in the Himalayas and in Chile. Edward Cayce believed this very powerful gemstone opens up the pineal gland. James’ journey towards an authentic spiritual life started with a book on Edward Cayce, the father of holistic medicine and one of the most document psychics of the 20th century. He found it among a pile of books left behind by a German friend in Brazil. Since them, he never stopped reading and learning all he can about the metaphysical realm. His visit to an Indian psychic in London and another psychic in Alberta, Canada revealed the same message. Both psychics saw the spirit of a Native American standing behind him and told him this spirit wanted him to do a vision quest. After that, he began having these dreams about the Native American. He did his quest for five days instead of three days, fasting and traveling throughout Mexico and South America. He’s earned several initiations in Lakota modality and experienced multiple shamanic journeys after completing seven five-day vision quests and three half-day fasting ceremonies. Though not every quest ended with a vision, he remained tenacious in his journey and continually worked towards his divine goals. How do you awaken into your spiritual truth? Just like James, we also have the ability to open up ourselves to our spiritual truths in places where vortices of energy or power nodes exist. He calls them “living cathedrals” and they exist around the world. Although crystals help us in our spiritual journey, getting to where we are meant to be ultimately depends on our willingness to trust our inner guidance to show us the way. As we enter into a powerful phase with the Mercury retrograde, we can make use of these crystals, such as quartz or silicone dioxide, to transmit and emit energy waves. Once we take these crystals to a sacred site, an axial tunnel line that is a connection to the source occurs. 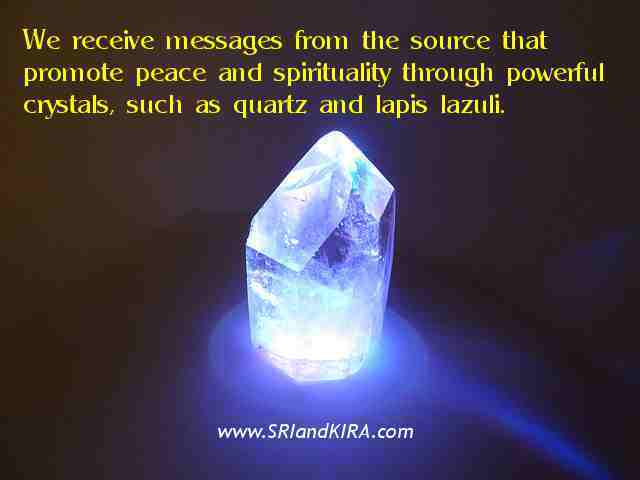 Through these crystals, we receive messages from the source that promote peace and spirituality.